A great value, this Air Force One Greeting Card is uniquely coupled with a high quality, lapel pin featuring the official emblem of Air Force One: The Final Mission, with all its symbolism. The attached Air Force One Lapel Pin is hand made of polished solid brass and hand laid, hard enamel cloisonné. The exclusive photos by the authors are not available in stores. The Air Force One greeting card is a large format gift card is printed on heavy stock and finished with a high gloss UV coating. 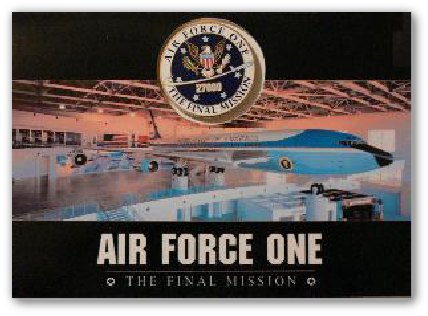 Measuring 4.5” X 6”, this card features the most famous aircraft in history on her perch in the Air Force One pavilion of the Reagan Library. This beautiful exclusive image shows Air Force One 27000 from a front ¾ view and from slightly above its nose. Extending out past the floor of its unique pavilion, 27000 seems to be moving. She reaches proudly forward and displays, as she did on every mission, the power and freedom of the USA. The cards are blank inside for your personal message or can simply be displayed on a shelf. The Air Force One greeting card makes a great gift and they are suitable for framing. The back of each card tells the complete historic story of Air Force One 27000. Individually wrapped and complete with envelope.